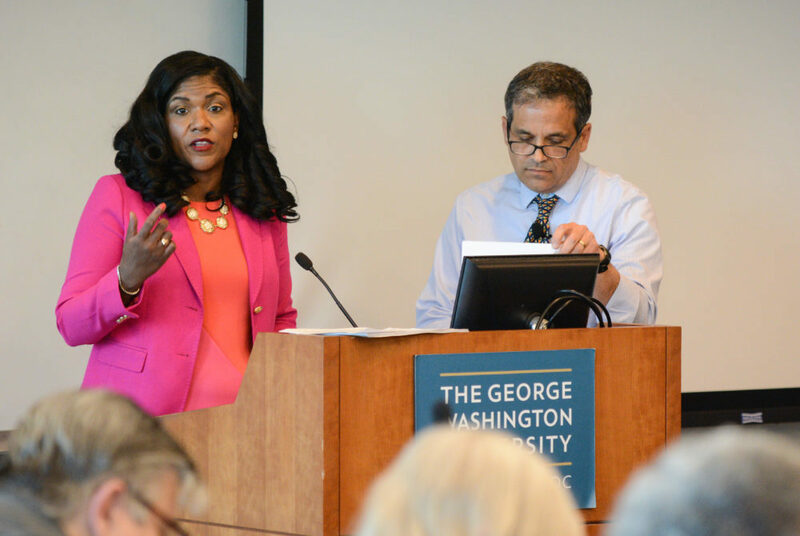 Caroline Laguerre-Brown, the vice provost of diversity, equity and community engagement, and Provost Forrest Maltzman present proposed updates to Title IX policies and procedures at a Faculty Senate meeting Friday. Officials released drafts of new Title IX policies Friday amid increased scrutiny about the way the University handles cases of sexual misconduct. Under the new policies, a single official will handle sexual misconduct investigations instead of a six-person faculty- and student-led hearing board, and all faculty will be mandated to report harassment to the Title IX office. The policies, which were presented at a Faculty Senate meeting Friday, still await approval from the Board of Trustees this week, but are expected to be instituted, officials said. The new policies follow a yearlong external review of GW’s Title IX policies and procedures by the law firm Cozen O’Connor. Officials brought in the outside legal experts last summer after the University’s policies came under fire when a senior and sexual assault survivor launched a campaign to expel her alleged assailant and claimed officials mishandled her case. The updates also come as the University is investigated by the Department of Education for possible violations of federal law for the way it has handled sexual violence complaints. Provost Forrest Maltzman said there is a “reasonable” chance the Board of Trustees will institute the new policies at its final meeting of the year Friday. He added that the new policies would be subject to continuous review if approved to ensure that the University’s stance on resolving Title IX complaints remains up to date. The new procedures expand GW’s 28-page sexual harassment and sexual violence policy to a 45-page document still subject to review over the next week. Under the proposed plan, officials will bring in an independent investigator to oversee sexual violence complaints, replacing a six-person hearing panel made up of volunteer students and staff members. The investigator, who could either be a University employee or an external hire, is responsible for gathering evidence, conducting interviews and deciding whether there is enough evidence to constitute a policy violation. Previously, the panel would hear complaints and consider witness testimonies and evidence to determine whether it was more likely than not that a violation occurred. In the new plan, officials will also outline at least 14 different types of staff roles, including all faculty and academic advisers, that qualify as “responsible employees” – staff members who must report any information about potential violations of the sexual harassment policy to the Title IX office. Previously, only department chairs, deans, supervisors and other top-level administrators fell under that title. Laguerre-Brown, the vice provost of diversity, equity and community engagement, said most staff members must be mandatory reporters as universities nationwide face difficult situations in which a “reluctant reporter” may ask faculty for confidentiality and then later say the University didn’t properly address their situation. “The professor says that they were honoring a request for confidentiality, and the response would be that you put the university above the needs of a student,” she said. “It’s about making sure that anyone who was a victim of sexual misconduct gets provided some form of support,” she said. Members of the Faculty Senate had mixed reactions to the new policies. Harald Griesshammer, a physics professor, said the new “responsible employees” requirement could negatively change the relationship between faculty advisers and their students, who often seek non-academic advice from faculty. He said the new requirement could “put students pretty off,” especially when they are not from the United States and do not have the same understanding of Title IX policies as domestic students. “From now on, when a student enters my room, the first thing, before they even open their mouths, is that I have to notify them that I’m a mandatory reporter,” he said. Philip Wirtz, the vice dean for programs and education at the School of Business, joined several other faculty members in criticizing officials for failing to give faculty members notice about the changes and not including them in the drafting process. “It’s a judgment call as to we’re better off adopting a policy that has some warts to it, but they’re not the kinds of warts that we have proven over time create horrible effects on our campus, as is the case of the older policies like the one we have now,” LeBlanc said. This article appeared in the May 14, 2018 issue of the Hatchet.